I know, wordy recipe name. But I can't think of a catchy name for it. Can you? It is what it is. 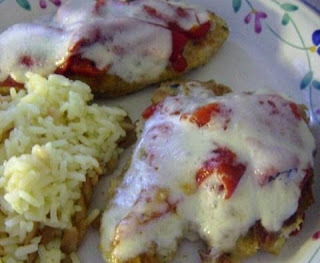 Breaded chicken breasts, partially cooked, then topped with roasted red peppers, provolone cheese, and ham, and then cooking finishes in a light pan sauce. Sort of like a lazy girl's cordon bleu. (Wait a minute...I think I just thought of a name! hahaha!) It's a quick, easy dinner to get on the table, and my husband just loves it. My oldest daughter will eat it if I leave the peppers off of her piece. sigh. If I must. Crazy kid. It's also very versatile. You can change the cheese--sometimes I use mmmmuenster (I don't know why, but that's fun to say), but you could use any other one you like. Cheese is your friend, you know. What would pizza and cheeseburgers be without cheese? They'd be crust and burger. Boring, right? You also don't need to use the roasted peppers. Sliced mushrooms are a good substitute. You get the idea, use your imagination and what you've got on hand. 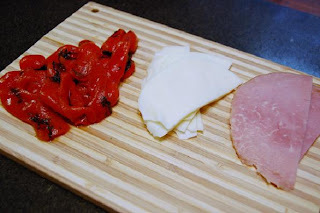 Roasted red peppers, provolone cheese, and ham, waiting their turn in this recipe. Sorry if the finished photo isn't the greatest, I'm trying, lol! And yeah, I need to make a shopping trip for props. That'll be hard work. Not. It may seem like a lot of bread crumbs and flour, but you know...I hate it when I'm breading chicken, getting messy, and I realize I need more to dredge the rest of the chicken in. By then, my hands are messy, and I have to call in reinforcements to measure out more stuff. So I overdo it now, and start with more. 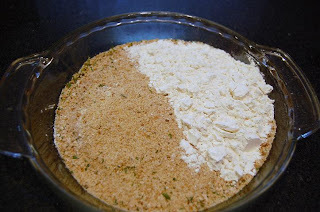 In a pie dish or plate, combine the bread crumbs and flour. 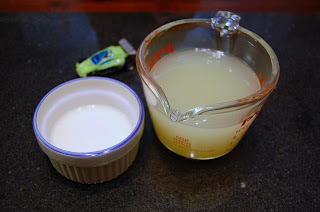 Combine the broth and wine, and dissolve the cornstarch in a small amount of the broth/wine mixture. Set both things aside. Here's the bread crumbs and flour before mixing. Here we see the broth and wine, along with the cornstarch mixed in with a bit of it. The Hot Wheels car is an optional ingredient. Season each piece of chicken with salt and pepper, then dip the pieces, one at a time, into the egg, completely coating them, then dredge each in the breadcrumb/flour mixture, set aside. In a large nonstick pan, heat the butter and olive oil over med-med high heat. Add the chicken and cook 3 minutes on one side, turn them and cook for 3 more minutes, or until mostly done. It's ok if it's *almost* done, because you'll be putting them back in the pan, anyway. Add the broth/wine mixture to the pan, scraping the bottom to get up all of the good cooked bits of chicken. The bits of stuff in the bottom of the pan? Also your friend. Add the cornstarch that you've dissolved in a bit of the broth and wine, and stir for a couple of minutes, until you see it start to thicken. Reduce the heat. Add the chicken back to the skillet, and top each piece with some ham, sliced peppers, and then the cheese. Cover and cook until the cheese is all melty, about 2 minutes. Serve with some sauce drizzled over each piece of chicken. If you find you want more sauce, increase the broth and wine to about 1 cup each, but you'll also need a bit more cornstarch. And here's the finished dish. I know, it could have used a green veg, but the peppers are a vegetable, right? Oh, and see up there? We got the green from the Hot Wheels car. That lazy cordon bleu looks really good! You can't go wrong with roasted red peppers, cheese and ham. Thanks, Nikki--have I told you I love you yet today? I do! muac! What kind of ham did you use. Hi Jackie--just regular old deli ham--any kind you like. A Food for Gossip Meme!